Your mom is in her eighties now, and although she’s been a very active person all of her life, when you visited her over the holidays, you noticed she isn’t moving around as well as she once did and since she lives on her own, you naturally worry about her. You’re especially concerned with how safely she will be able to get in and out of the bathtub now, so you chat with your sister and decide it’s time to do something to prevent an accident. 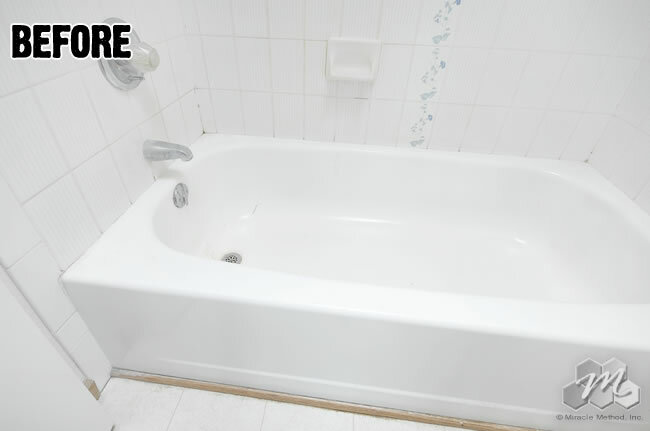 There’s simply not enough money in anyone’s budget to completely remodel mom’s only bathroom, so you start looking at the process of converting her tub into a shower. Your internet search leads you to Miracle Method’s option – the Easy Step®. The Easy Step® product will convert her bathtub into a shower in just one day for a fraction of the cost of a walk-in tub. To install an Easy Step, Miracle Method technicians will cut a 24-inch wide by 9-inch tall notch in the side of the tub, allowing the person to step through, rather than over, the side of the tub. Stepping through significantly reduces the risk of one losing their balance and falling, making bathing easier and safer. Best of all, the Easy Step® is available in two options, the traditional Easy Step® and the Easy Step® with a door – perfect for home with residents of varying mobility ranges. 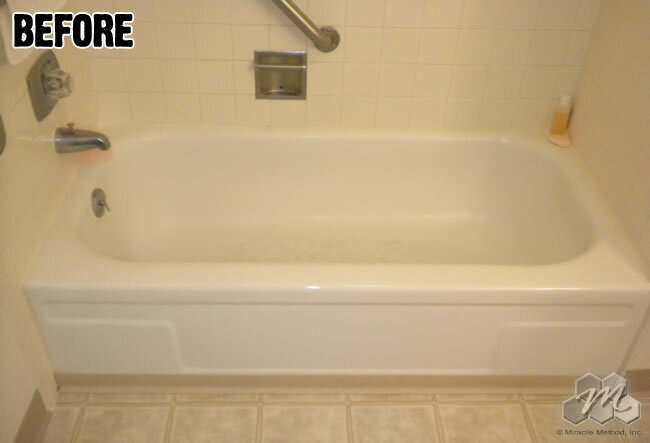 If you keep the cut out tub piece, Miracle Method can re-install it to look like new should you decide to sell the house or want to return to a conventional bathtub. Additionally, you can choose for Miracle Method to install the Easy Step® Bathroom Safety Package, which includes the tub to shower conversion, as well as ADA approved safety grab bars and a slip resistant surface. Other options that can be added to this package include a curved shower rod, a hand-held shower rod, and a tub chair. With the Easy Step®, your mom can maintain her independence, and you’ll feel more confident about her safety and well-being. Visit the Miracle Method website to learn more about the Easy Step® tub to shower conversion, or contact a franchise near you by calling 855-212-7337. The summer vacation season is often a time in which we head out to visit family members who live out of town. Adult children often use some of their summer vacation time to visit their parents who they may only see a time or two a year. Sadly, this is usually the time in which they notice that mom or dad isn’t getting around as well as they once did. Their parents’ safety and how they navigate their home, especially the bathroom, becomes a concern. Something must be done in order to ensure the safety of our parents when we can’t be there. Since most senior adults want to live in their own homes for as long as they possibly can, one option would be to remodel the bathroom to accommodate a parent’s needs. However, remodels are costly, messy, and time consuming, and most senior citizens live on a limited budget and can’t wait for weeks or months on a renewed bathroom space to be installed. A quicker, more cost-effective solution is necessary. Miracle Method has just the solution adult children and their parents are looking for – an Easy Step Bathroom Safety Package, which includes the Easy Step tub-to-shower conversion, grab bars, and the application of a slip resistant surface. 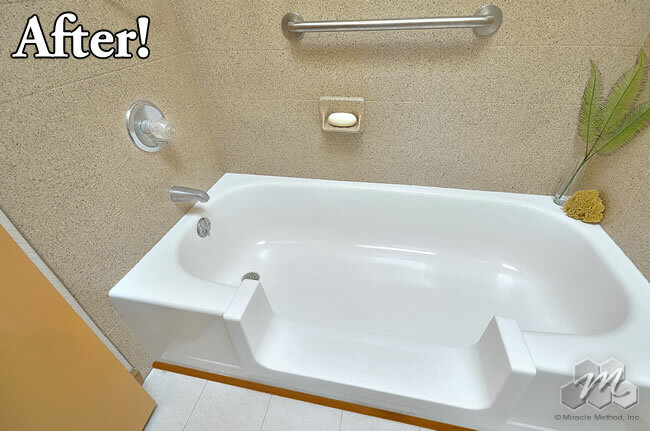 The Easy Step tub-to-shower conversion creates an opening in the side of a tub that will allow bathers to step through the side of the tub, instead of over it, which can significantly reduce the risk of loss of balance and falls. It can be installed with or without a door depending on the needs of the homeowners. The ADA-approved grab bars and slip resistant surface will also help prevent accidents and injuries due to slips and falls. Before: The wall of the tub was difficult to step over, which could cause one to fall. 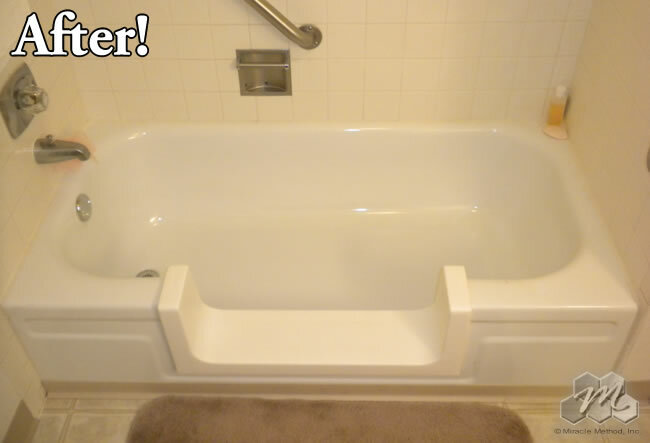 After: The Easy Step conversion and grab bars make getting into and out of the tub easier and safer. With an Easy Step Bathroom Safety Package from Miracle Method, your parents can bathe easier and safer, and they’ll be able to stay in their own home for much longer. You’ll have peace of mind in knowing they can better take care of themselves. If you and your parents are interested in learning more about Miracle Method’s Easy Step Bathroom Safety Package, please use our online locator or call 855-212-7337 to locate a franchise near you.